This topic contains 1 reply, has 2 voices, and was last updated by Kishor 2 years, 10 months ago. 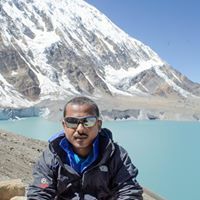 I am interested in doing the annapurna base camp trek from the middle to the end of may. I am in pokhara now though and the visibility isnt great. I was wondering if anyone had just come back from the trek and could let me know if you could actually see the mountains? Have you done the trek? If so, can you tell us whether it would be wise to do the trek in July? I and my brother are planning to do the trek from July 1 to July 9. We would be glad to hear from you.